Food processing in tin is arguably the optimal way to preserve foods for long periods of time. Self contained meals complete with durable serving container and cookpot. Canning in TIN takes the glasswork out of canning. 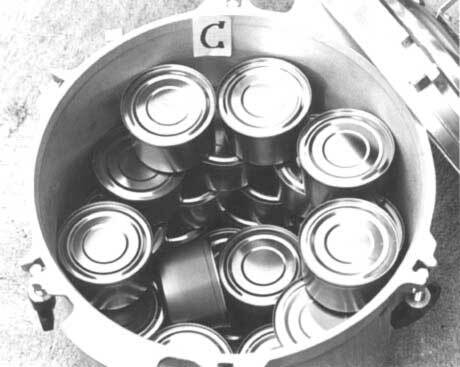 It is faster, easier, uses less energy, exact controls when sealing the cans closed every time, put a greater volume of canned food into a pressure cooker, shorter overall processing times, air or water cool, ultra violet light damage to food, better retained nutritional content in tin canned food, NO glass breakage, flood proof, stores longer. Completely Portable: Kitchen, Backyard, Boat or Campsite. Cans may be shipped via UPS and U.S. postal service. Cans are the preferred choice by Hermetically sealed storage of emergency food, water and medical supplies. Keep supplies safe from loss due to damage and contamination. Cans are a cost effective Choice. Cans are less expensive to give away.